Redco™ Deadplate is a high performance, energy dissipative grade of polyurethane designed for applications where extreme impact absorption is required. Redco™ Deadplate converts up to 90% of impact energy into heat, which dissipates through the material. Impact and shock pads, etc. Redco™ Deadplate is the ultimate shock absorber. 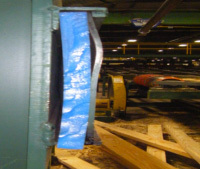 Shown in the video below is an application within a sawmill, the logs are stopped dead before continuing on the chain bed which eliminates structural damage and protects surrounding equipment.